Live Q&A discussing member questions regarding transition faults and correction strategies. Live Q&A: Shanks and Yips - Dec 18, 2017 Discussing member questions about shanks and yips. 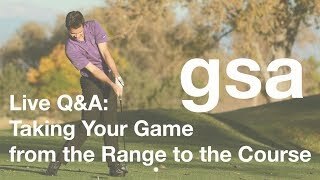 Live Q&A: Off Season Training - Fitness and Skills - Jan 1, 2018 Discussing member questions about the big movements of the golf swing. Live Q&A: Training Aids to Assist Learning - Jan 15, 2018 Discussing member training aid questions.